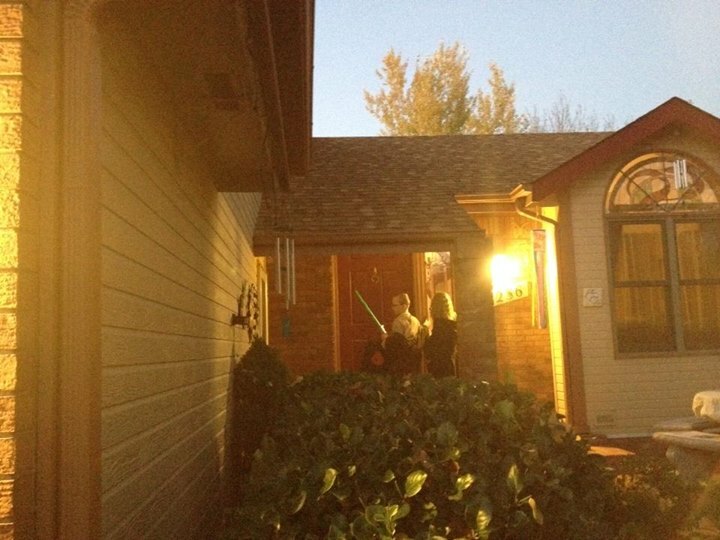 The kids and I went trick-or-treating tonight while Jim (he’s battling a cold) handed out candy. It was an evening of irony. Liam was being such a pain in the rear about cleaning his room, wearing his costume, and generally being a nice family member, that he was facing the potential loss of Halloween. Then both kids left trash for the grownups to clean-up (doesn’t fly in our house) and we were at the tipping point of staying home. Funny thing . . . once my children started knocking on doors they were magically transformed into the most polite and adorable kids. They said, “Yes, please,” and “Thank you,” and “I like your dog,” and “Happy Halloween,” and were so affable that more than half the houses we visited gave them extra candy. So, while our route was shorter this year, they got just as much loot. As much as I wish my kids were as nice to me and Jim and to each other as they are to strangers, I know that they have mastered something at ages 9 and 10 that many adults will never learn. Simple gracious manners will last them their entire lives. Lord knows that family relationships are much more complicated, so they’re doing great for their age. I’m especially proud of my kids that I never once, not once, had to remind them to say thank you. I’m proud of Jim and myself because we taught them to be kind and pleasant by modeling that behavior. We taught them to be the way everyone wants and deserves to be treated, and tonight our neighbors found our children to be a real treat. I’m also proud of myself because this is my 31st blog post since October 1st. I know now that I can keep to a blogging schedule. Now I just have to create one. Happy Halloween, and thank you so much for reading along!